I am not always good at acknowledging when I have accomplished goals I have set. In fact the momentum from stress and the pressure I place on myself to be diligent at tackling my to-do list keeps me running at full speed most days. When I complete one task…on to the next I go…as fast as I can. I believe the more I can squeeze in, the better I will feel as a wife and mom. However, there have been several times that I sputter out of energy, feeling completely inadequate as the daunting endless demands pile higher – placed there by me of course, with no regard to my physical limitations. This method does not work so well when it comes to marriage or mothering. It leaves a gaping hole where discontent and insecurity try to fill in. It is important for me to take time to stop and celebrate the victories in my life, whether great or small. I got the laundry done. I cleaned the bathroom. I forgot a few ingredients while shopping, but I made dinner. I spent time with God in prayer. I took a moment to affirm my husband. I slipped with my attitude and snapped at my husband, but being aware of my fault is getting easier and I apologized quickly. These are all good things I can take a moment to celebrate. These are areas of my life I am accomplishing just as I set out to do, things that inspired my heart, things I feel will fulfill my roles as a wife and mother. Being able to celebrate is all about perspective. I can look at this same list and feel as if I hadn’t done enough, or think that I need to do more… that I need to do better. Although I will always know there will be more to do, I cannot sulk in self-pity at the things I didn’t do. I need to appreciate all the hard work I did do and acknowledge God for helping me do it. The ability to celebrate and be content and thankful comes from my perspective. Celebrating will show me just how far God has brought me in His strength. Celebrating will help me view my marriage in faith. Celebrating will protect my joy. 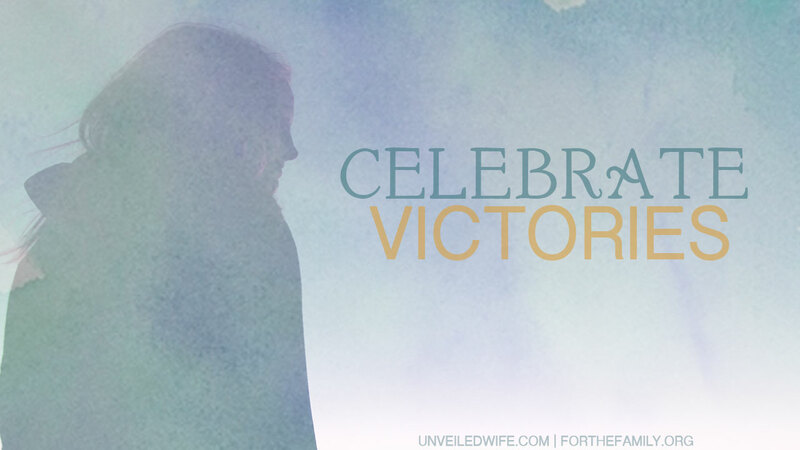 Do you stop to celebrate the victories in your life?